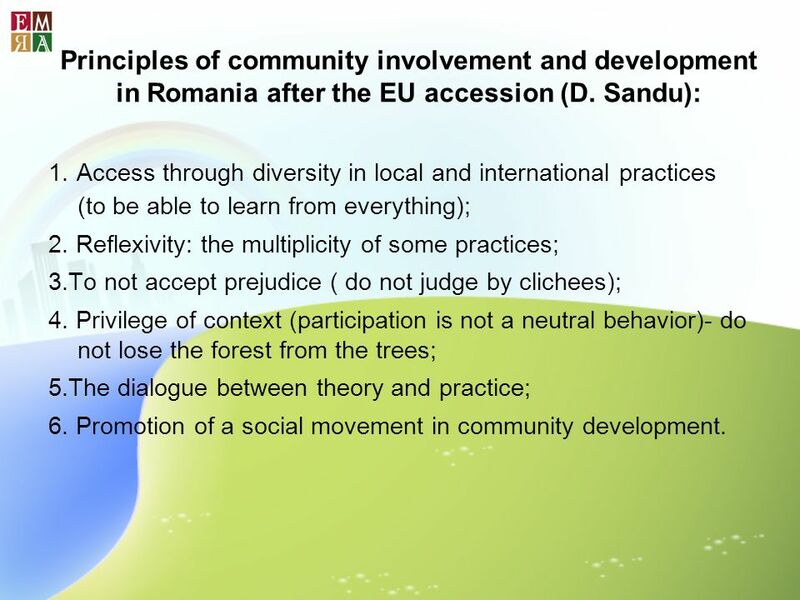 3 Principles of community involvement and development in Romania after the EU accession (D. Sandu): 1. Access through diversity in local and international practices (to be able to learn from everything); 2. Reflexivity: the multiplicity of some practices; 3.To not accept prejudice ( do not judge by clichees); 4. Privilege of context (participation is not a neutral behavior)- do not lose the forest from the trees; 5.The dialogue between theory and practice; 6. Promotion of a social movement in community development. 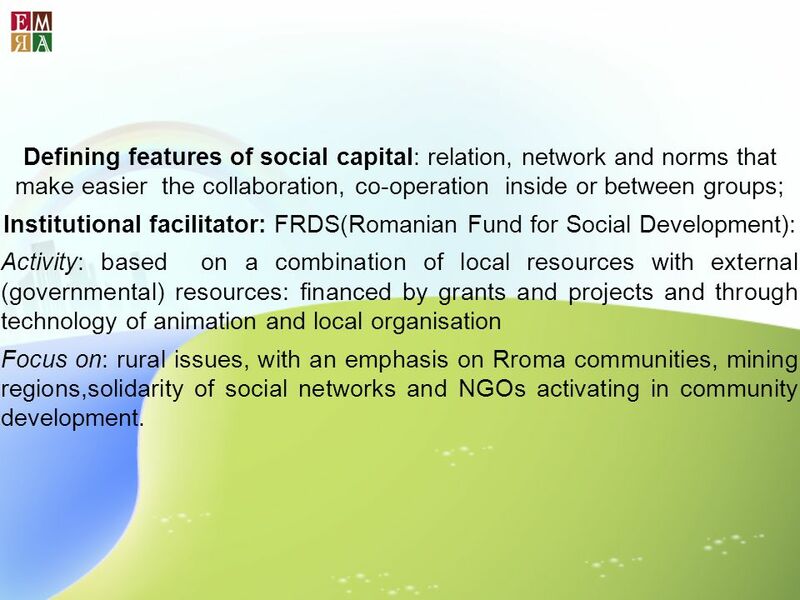 4 Defining features of social capital: relation, network and norms that make easier the collaboration, co-operation inside or between groups; Institutional facilitator: FRDS(Romanian Fund for Social Development): Activity: based on a combination of local resources with external (governmental) resources: financed by grants and projects and through technology of animation and local organisation Focus on: rural issues, with an emphasis on Rroma communities, mining regions,solidarity of social networks and NGOs activating in community development. 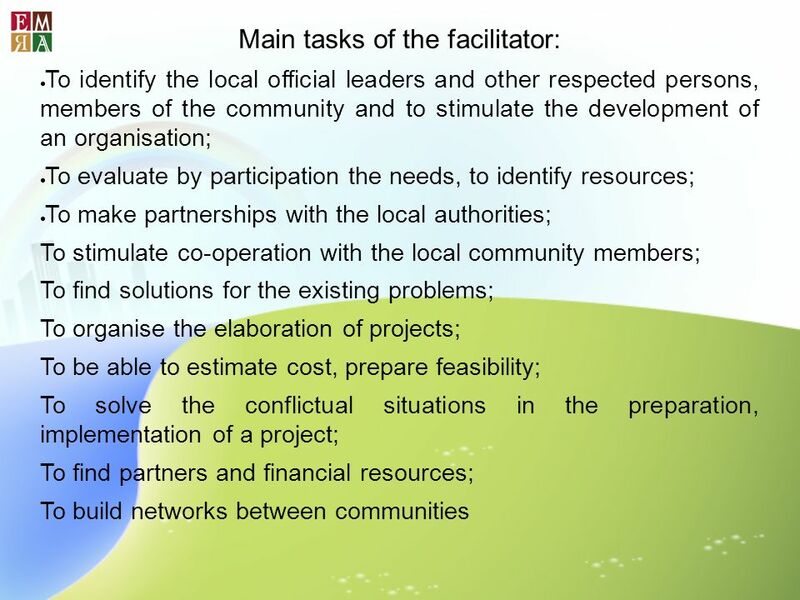 5 Facilitation: as a community organisation process deals with: -Solving specific problems; -Planification of some projects; -Development of local leadership -Construction of community organisation that represent the community; -Mobilisation in order to solute present and future problems); -Revitalisation of local institutions. 6 Facilitation as a process aims to decrease of poverty (through fast, large economic development), of modernisation of traditional values, institutions and practices. Tasks of community facilitator: evaluate local needs, understanding and applying developmental projects, combining the old end new( methods like mental and social map, diagrams, focus-groups, participative observation). 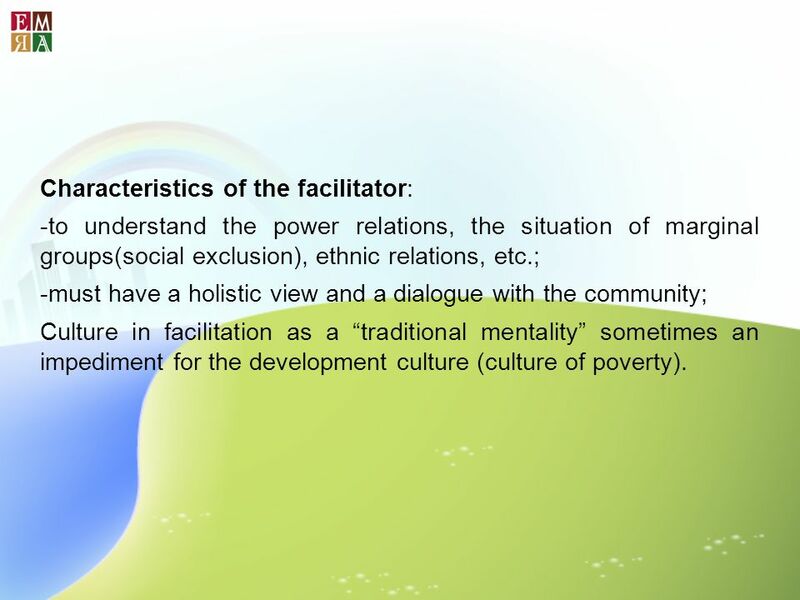 7 Characteristics of the facilitator: -to understand the power relations, the situation of marginal groups(social exclusion), ethnic relations, etc. ; -must have a holistic view and a dialogue with the community; Culture in facilitation as a traditional mentality sometimes an impediment for the development culture (culture of poverty). 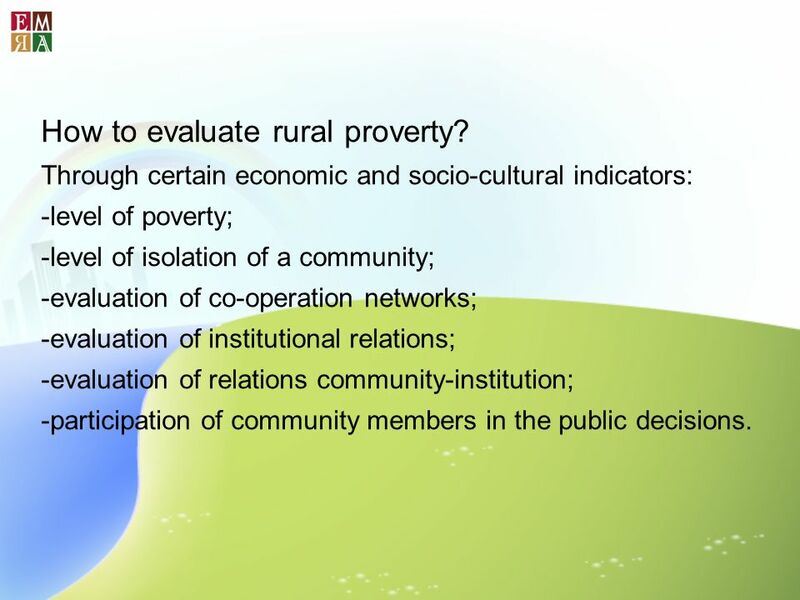 8 How to evaluate rural proverty? Through certain economic and socio-cultural indicators: -level of poverty; -level of isolation of a community; -evaluation of co-operation networks; -evaluation of institutional relations; -evaluation of relations community-institution; -participation of community members in the public decisions. 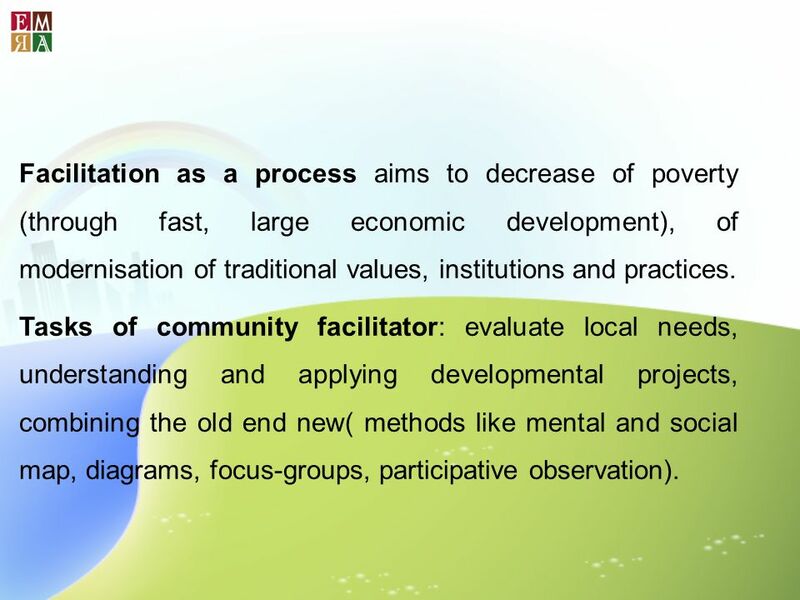 9 Phases of facilitation: -Diagnosis of the community; -Identification of local leaders; -Choice of a group of initiation; -Identification of priority needs; -Legitimation of a problem that becomes the scope of the project, -Monitoring the community for making the project. 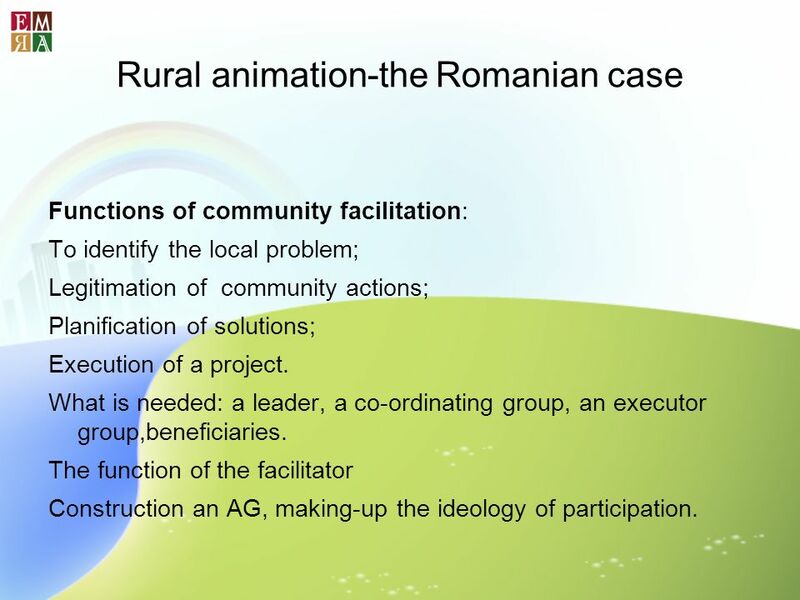 11 Rural animation-the Romanian case Functions of community facilitation: To identify the local problem; Legitimation of community actions; Planification of solutions; Execution of a project. What is needed: a leader, a co-ordinating group, an executor group,beneficiaries. The function of the facilitator Construction an AG, making-up the ideology of participation. 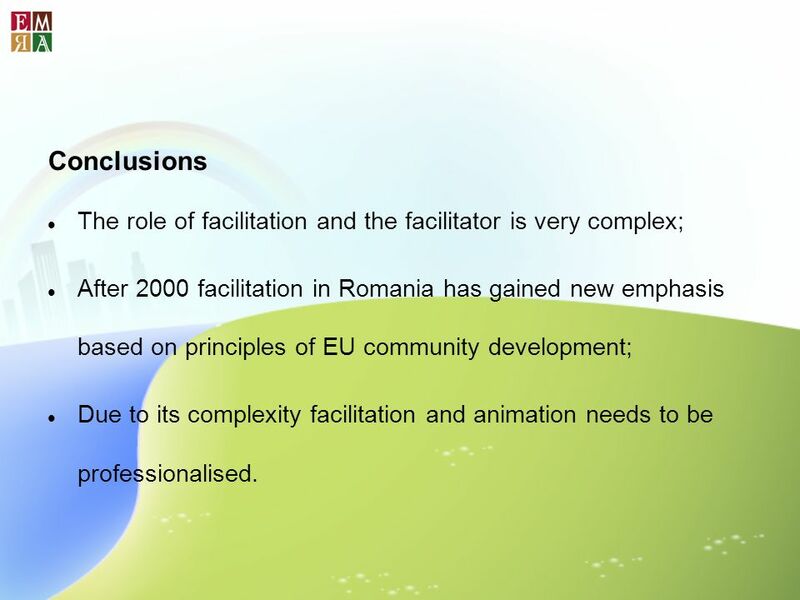 12 Conclusions The role of facilitation and the facilitator is very complex; After 2000 facilitation in Romania has gained new emphasis based on principles of EU community development; Due to its complexity facilitation and animation needs to be professionalised. 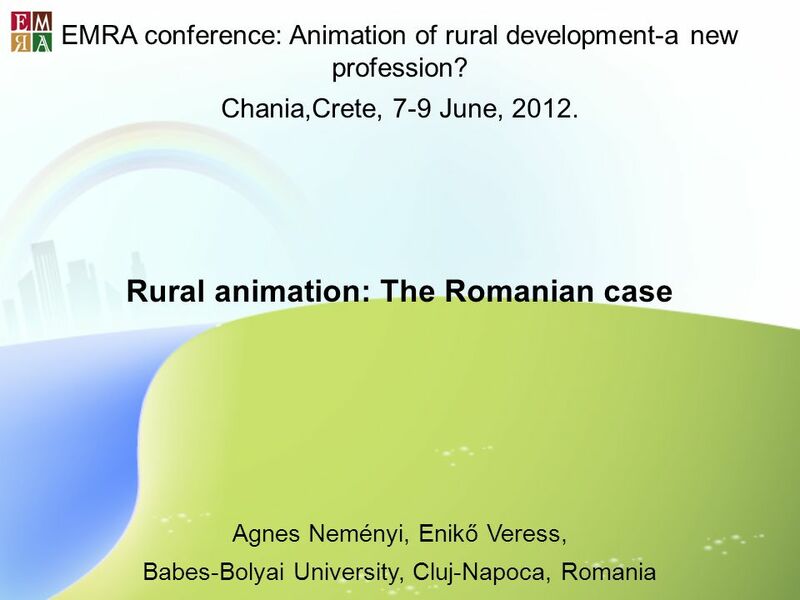 Download ppt "EMRA conference: Animation of rural development-a new profession? Chania,Crete, 7-9 June, 2012. 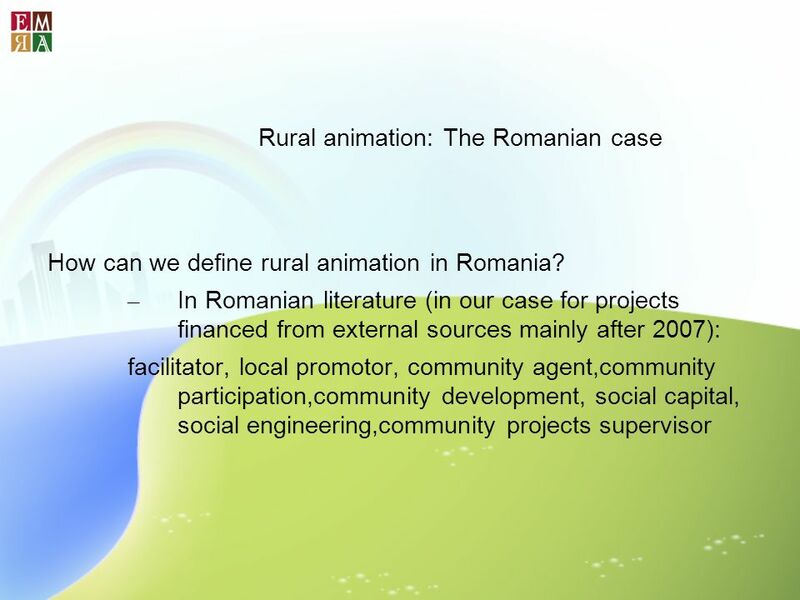 Rural animation: The Romanian case Agnes Neményi, Enikő"
International conference: Enikő Veress, social researcher, Faculty of Sociology and Social Work, Babes-Bolyai University, Cluj-Napoca, Romania In search. CNVOS - Centre for Information Service, Co-operation and Development of NGOs Structural Funds for NGOs in Slovenia Tina Michieli. 117/02/2014 Dr. Hubert Krieger Eurofound (Dublin) Dr. Hubert Krieger Eurofound (Dublin) New ideas for integration policies based on experience of European. Ministry of Health Anna Starzewska-Sikorska, Ph.D. Coordinator of environmental part of Programme Institute for Ecology of Industrial Areas, Katowice POLISH. Financial support for integrated rural development in the Nitra Self-governing Region Office of the Nitra Self-governing region Department of strategic. Regional Meeting of Ministers of Education on the Implementation of the European Higher Education Area 17 – 18 October 2013 Yerevan Overview of the student. Tailored training for professionals in the rural tourist sector FORESTUR CIDAf Valencia,15-19 November 2006. This project is funded by the EUAnd implemented by a consortium led by MWH Amman – 23 April 2012 RCBI ‘handover’ meeting Jordan. This project is funded by the EUAnd implemented by a consortium led by MWH RCBI ‘handover’ meeting Estonia-Latvia-Russia ENPI CBC Programme Riga, 20 March.